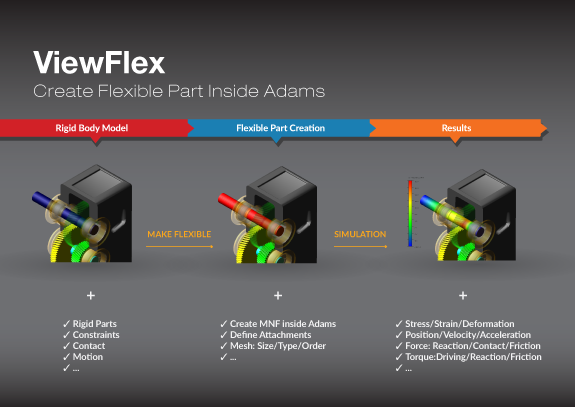 Adams allows you to create flexible parts conveniently even in the presence of large overall motion and complex interaction with other modeling elements. Engineers can incorporate a linear flexible body, as well as nonlinear flexible parts to solve problems involving large deformations and material nonlinearity. 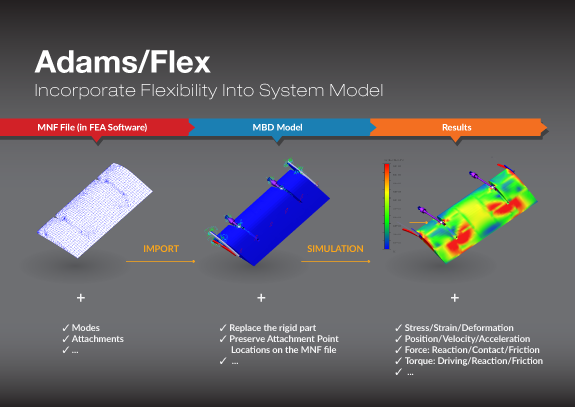 Adams Flex allows importing finite element models from most major FEA software packages and is fully integrated with Adams package, providing access to convenient modeling and powerful post-processing capabilities. Replacing some key rigid components with flexible parts will increase the accuracy for load prediction. The FE Part is a wholly Adams-native modeling object which has mass and is accurate for very large deformation cases (that is, geometric nonlinearity) of beam-like structures. It provides a fast way to model geometrically nonlinear parts in system model. 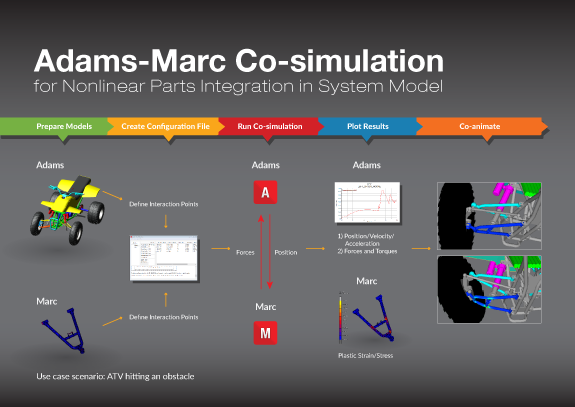 The Adams-Marc Co-simulation enables users to perform real co-simulation between world-class Marc nonlinear FE technology with world-class Adams MBD code. With that, MBD engineer can increase model accuracy by including non-linear structural behavior. It's especially beneficial for applications involving high deformation of viscoelastic materials. Re-meshing can be required using this co-simulation. 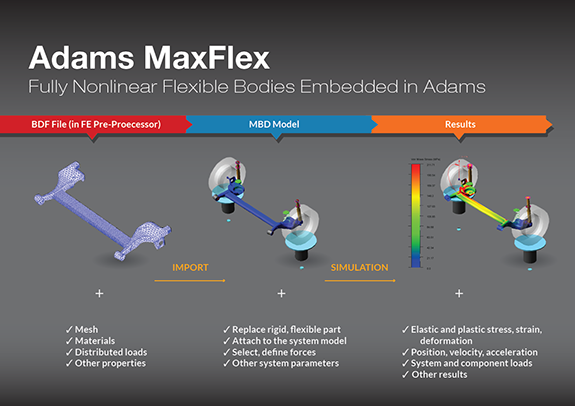 Based on the implicit nonlinear finite element analysis, Adams MaxFlex allows for the representation of geometric nonlinearity (i.e., large deformations), material nonlinearity, and boundary condition nonlinearity in Adams models. 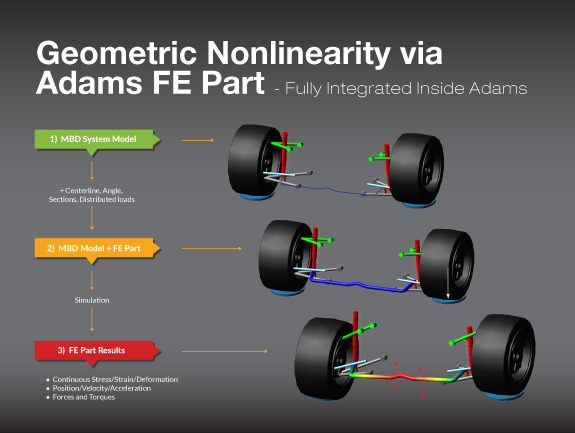 While FEA technology is used to represent and solve the nonlinear flexible body, it is embedded wholly within Adams, so no additional FEA software is required to solve the model.